12 letters are read to the audience. 12 letters from trapped men facing almost certain death to loved ones. Letters written by dispirited, depressed and doomed German solidiers to their relatives, friends and lovers back home. To people who had no idea of the reality of their situation and who were being fed a diet of propaganda and misinformation about the war. 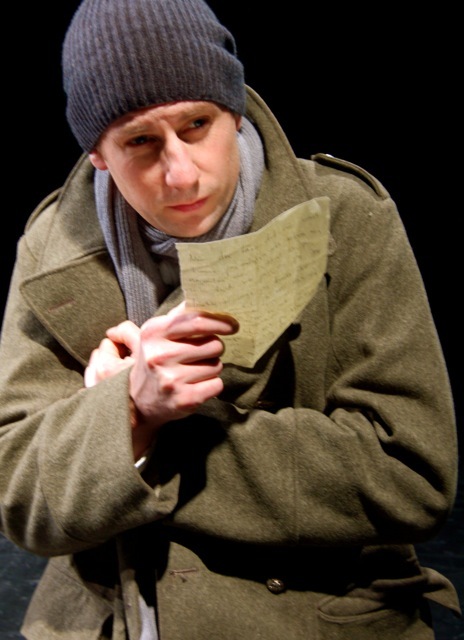 Jesper Arin gives an intense performance as he takes as through the distressing but sometimes touching letters. All is accompanied by a mix of the Appassionata by Scottish violinist Ian Peaston with electronic distortion that creates a chilling, sorrowful atmosphere. The play hits you emotionally and makes you think about big questions of belief, survival, suffering and love. As the production notes say: “The letters contain messages of hate, longing and despair but they also send us reassurance, love and hope.” You can’t help but identify with the soldiers because they are experiencing emotions which are part of all of us, they are universal. The letters never arrived, they were censored because they did not support the German war effort.